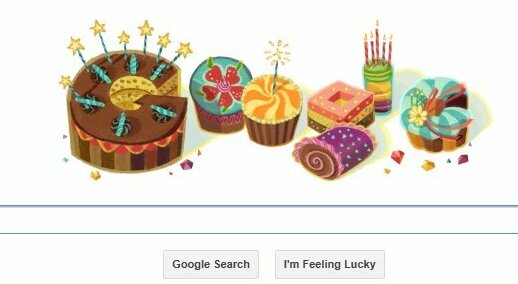 AllThingsDigitalMarketing Blog: Wow, Google created an adorable doodle today for my B-Day; You can have one for your B-Day too. Wow, Google created an adorable doodle today for my B-Day; You can have one for your B-Day too. I got a really cute surprise treat this morning when I went to the computer. Google created an adorable doodle for my birthday. Happy Birthday to me, LOL. I'm amazed, and never dreamed Google would do this. The doodle has candles, cupcakes and all...What a sweet thing to do! The rewards of digital, social media, and evangelism! My best to all today! I'm feeling happy! I'm sure Google can do the same for you -- simply set up your Google+ and make sure to enter your birthday and see what happens on your special day. First I thought it was my imagination or "was I dreaming?". But when I moused over the doodle, it displayed "Happy Birthday Gloria!" This looks really very nice. Google really creates awesome doodles during festivals and occasions. I'm connected to this world, well if connected with Google, Is that not the world.? Now, am I the only one who sees Happy Birthday Rachelle?, THANK YOU! That is too funny. Thank you Rachelle, hope your birthday was great!